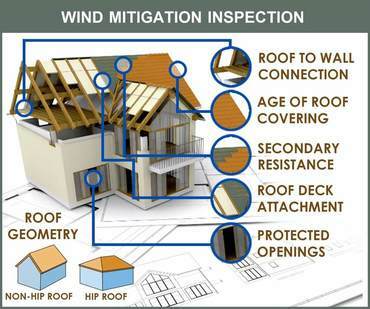 A Wind Mitigation Inspection is NOT a Roof Certification Inspection. It is NOT a substitution for a full Home Inspection, It is far less comprehensive. Wind mitigation is the use of certain building techniques that limit damage caused by intense wind. Here in South Florida area, our homes are at risk for damage by high wind mostly during hurricane season. Wind mitigation has become increasingly important for homeowners in the South Florida area as many insurance companies look to decrease their risk. This is the only inspection that can help lower your homeowner’s insurance. Here is 8 key categories that the inspector is looking for. 1. Roof Covering: inspectors want to know when the roof was installed and does if it meets building codes. 2. Roof Deck Attachment: Inspectors will determine what type of roof decking is used and how it’s attached to the underlying structure. For example, if it’s nailed or stapled down. If nails are used, nail length and spacing between each will also be noted. 3. Roof to Wall Attachment: the roof attachments become the focus here: are trusses attached with nails or hurricane clips? Are the wraps single or double? The more secure your roof, the more significant the savings. 4. Roof Geometry: is your roof hip, gable or other? The inspector is looking for how it’s shaped – a hip roof resembles that of a pyramid and is a qualifier for a discount. 8. Opening Protection: Here, inspectors are looking for shutters and installed-protection devices from wind-born debris for doors and windows. They will also be checking the rating of the devices, if you have them (as in- are they hurricane-rated?). 100% of all openings (All or nothing) need to be covered with Hurricane rated protection to qualify for this discount.